San Carlos Institute Founded in 1871 by Cuban emigres, the San Carlos is one of Key West's most historic landmarks. Seeking to preserve their language and traditions, the Institute is dedicated to the promotion of Cuban cultural values and ideals. 516 Duval, (305) 294-3887. Heritage House Museum was the home of Jessie Porter Newton, who founded the Old Island Restoration Foundation. Built in 1832 by wrecker George Carey, the house was a gathering place for actors and writers, among them poet Robert Frost, for whom a cottage on the grounds was named. Antiques and mementos from early Key West are displayed in this fascinating home. Pirates and early settlers used what is now called the Pirates Well to gather water. The well is located near the front door of the house. 410 Caroline, 296-3573. Key West Art & Historical Society is a 52-year-old non-profit organization dedicated to preserving and promoting the culture and history of the Florida Keys. Founded in 1949 by a small group of culturally concerned citizens, it now has grown to more than 1,000 members from the Keys, Florida and elsewhere in the U.S. The Society, headquartered in the architecturally-restored U.S. 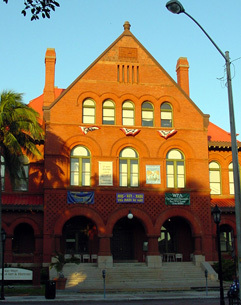 Custom House at Front and Greene Streets in Key West, operates three important Museums on the island: the East Martello Museum and Gallery, 3501 S. Roosevelt Blvd., the Key West Lighthouse Museum and Keepers Quarters, 928 Whitehead St. and the Key West Museum of Art & History at the Custom House, 281 Front St. For memberships and more information about the Society and its events, please call (305) 295-6616 or visit the website at: www.KWAHS.com. Mel Fisher Maritime Heritage Museums exhibits specialize in maritime history from the 1500s to the late 1700s. 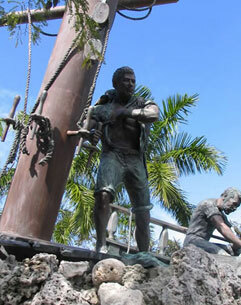 Founder Mel Fisher discovered two Spanish galleons from the 1622 fleet, Nuestra Señora de Atocha and Santa Margarita. The museum displays collections of gold bullion, coins and personal effects recovered from the two sunken ships and artifacts from the slave ship Henrietta Marie, which sunk off the coast of the Florida Keys. One of the most interesting objects displayed is the Poison Cup. This cup held a rare bezoar stone used to detect different poisons. 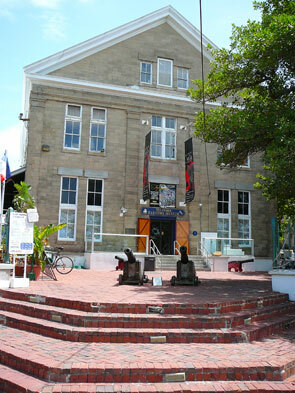 The museum's current exhibition, Pirates: Menace & Mayhem, runs through June 2012. See authentic pirate treasure, learn the difference between Hollywood fiction and piratical fact, and visit a recreation of a pirate pub. Wreckers Museum/Oldest House. Built in 1829, this home was owned by Captain Francis Watlington, a prominent early wrecker, who lived there with his wife and nine daughters for a number of years. The home remained in the Watlington family for over 150 years. His daughters played with an elaborate doll house, which remains on display in an upstairs bedroom. The museum houses relics of the wrecking and salvage industry in early Key West, including a sheet of rules governing the profession. The house, given to the state by Mrs. Robert Austin in 1974, is now maintained and operated by the Old Island Restoration Foundation. The grounds contain the Rosemary Austin Memorial Garden honoring the homes donor. 322 Duval, 294-9502. 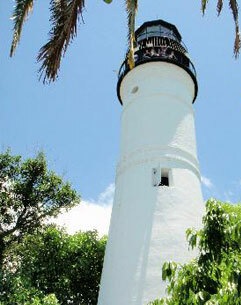 Other Key West museums and attractions include The Hemingway House, Southernmost House Audubon House & Gardens, Bahama Village Museum and Casa Antigua. The Florida Keys Council of the Arts is the main source of information on arts and culture in the Keys. Check out www.keysarts.com. The mission is to promote all the arts  visual, performing, literary, cultural, and historical arts and their display.